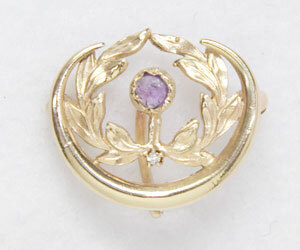 This 14K yellow gold antique watch pin is worked in the shape of a wreath. An amethyst and a single diamond are set in the center. 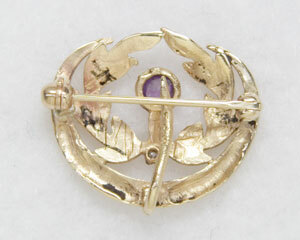 The hook on the back of this chatelaine pin was used to hold a pocket watch. It measures 7/8” in length and 3/4” in height. Circa: 1930.